I've been looking for overalls ever since last spring, but I didn't really find anything that I liked. I picked up these overalls recently during my trip to New York while doing some late night shopping at the Forever 21 store in Times Square. Oddly enough, the metal zipper was the one that drew me into it. It was a nice contrast to the black leather and also gives it a more rugged and almost biker-ish look. The (faux) leather version doesn't leave you feeling like your overalls are from OshKosh B'Gosh, unlike its denim counterpart. It's definitely a more grown-up version of a childhood staple. You pull this off so well! I on the other hand probably couldn't lol! 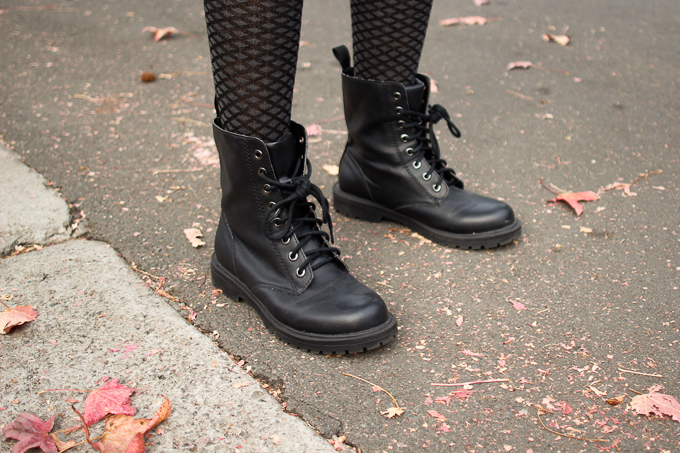 Loving faux leather anything too and those combat boots are a perfect pairing to your overalls!